If you’re thinking of a career change, have you considered becoming a letting agent? 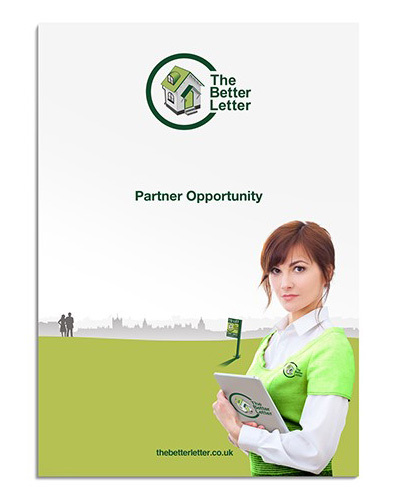 If you’d love to combine the excitement and satisfaction of being self-employed, the freedom to work from home, and the security of working as part of an established lettings brand with continuous training, support and advice, then you are an ideal candidate to become a Better Letter partner. What makes a Better Letter? We are looking for ambitious, motivated individuals who would like to grasp the opportunity to provide themselves with financial security and rewards far exceeding that of being an employee. An interest in property, excellent customer service and attention to detail is required. Previous experience in lettings is helpful but not essential. You may be looking for a solid 9-5, five day week. Or you may want the flexibility to fit in around school hours or other commitments. We’re not running a ‘get rich quick’ scheme - we want you to plan how many hours you want to work and how you want to organise those hours to suit you (and possibly your family! ), to make the income that you need for a decent and rewarding life. Our fully online systems match the way that people really look for rented property now. There’s no need to spend money on expensive high street premises anymore. No need to spend up to three hours a day commuting. You can be part of a real business with all the freedom of working from home and schedule your appointments to suit you and the clients. All of our partners will benefit from our property industry knowledge, not to mention our ongoing expert sales & marketing training. The Better Letter brand will benefit you directly by giving you the kick-start and quick growth needed to take market share. As part of our family, you’ll receive the Better Letter start up tool kit and have access to our support and services every day. While some industries are subject to fashions and whims (salsa class franchise, anyone? ), there will always be a demand for rental properties and that demand is currently growing. Property is resistant to technological innovation or ‘faddish trends’ - it still relies on quality agents providing a personalised local service and someone on hand to deal with viewings and property maintenance. Britons currently pay in excess of £48 billion in rent to landlords, with this set to exceed £70 billion during 2016. People with savings are choosing to invest in buy-to-let properties and recent pension reforms have seen more people than ever entering the buy-to-let market as they cash in part of their pension pot, to get a better return from property. These new landlords want reliable tenants who will pay the rent and look after their property. It is the professional letting agents who are in the business of supplying these reliable tenants and safeguarding the landlord’s investment, who will win the day. The lettings business is thriving in the UK and, for over a decade, the buy-to-let market has grown on average by 8% per year. If the market continues to grow at this rate, established property brands like The Better Letter will benefit hugely. Want to know more about becoming a Better Letter partner? Simple, call our MD Simon Fisher on 01865 339 335.